If you are down in the South West this weekend and fancy a day out, there is the Cheese and Agricultural Show in Frome on Saturday. Cheese makers have been visiting the Show for 151 years, coming far and wide from across the globe. This year there will be around 1,200 award-winning cheeses to set your tastebuds going. Not only that, but there will be entertainment from a motorbike display team, dog agility, lurcher racing plus many other countryside pursuits and rural crafts. It’s a family-friendly event with 20,000 visitors last year and even more expected this year as its popularity grows. Why not rest your head at this lovely family house in Compton Bishop, Somerset (sleeps 12). The Mendips rise directly behind Compton House with good walks up to Crook Peak. The property has a south-facing terrace running along the length of the house with plants, table/chairs, fire pit and BBQ. There is also an enclosed lawn, croquet lawn (mallets provided), children’s adventure playground, trampoline, outdoor heated swimming pool (available 24 May to 13 September) and all-weather hard tennis court. Games room (pool table, darts, table football, Wii, iPod dock, TV/DVD). Table tennis in garage. Fun coarse fishing available on the river Yeo, up to 15 March and after 15 June (licence required). Inside the property consists of a big open plan kitchen/dining room, utility room, loo, large living room and sitting room with open fire. Upstairs there are four bedrooms (three doubles and a twin with en suites). At the rear of the house is a smart annexe: hall and two double bedrooms, one with en suite bathroom (suite) and the other with en suite shower-room (wet-room suite). 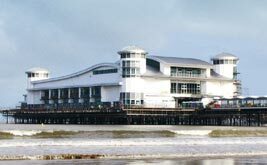 Just two years after it was devastated by fire, the pier at Weston-super-Mare was due to re-open as we went to press. A £51 million refit has left the pier well equipped to meet the needs of 21st century holidaymakers, with new high-tech rides and games, including two genuine formula one simulators where drivers can see just how good they really are. The pier’s owners, brother and sister Kerry and Michelle Michael, are aiming high with the ambitious project. They want the pier to be an all-year attraction,with a hall large enough to hold 3,000 people for concerts or 1,000 for banquets, as well as conference facilities. Traditional holiday visitors and day-trippers will be catered for by the amusement park, which includes 18 rides, as well as 26 shops and food outlets. 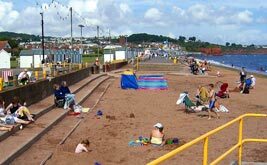 Entrance to the pier remains free, so it will be possible simply to stroll out to sea or sit in the sun, but the Michaels hope the wide range of attractions will see 3.5 million visitors a year spending an average of £4.60 each. A combination of good early summer weather and economic uncertainty produced a late booking surge for UK-based holidays, with many people leaving their holiday decisions to the last minute. The surge in UK holidays follows news that last year the number of trips made by Brits to foreign countries fell at the fastest rate since the 1970s, according to the Office for National Statistics. In 2009 the ONS recorded 58.6 million trips, down from 69 million in 2008, and says the number of foreign visitors coming to Britain also fell, though only from 31.1 million to 29.9 million. That’s in sharp contrast to the previous 25 years, when trips abroad grew on average by 4 per cent a year and trips into the UK by 3.2 per cent.